Hand sewing is an art form that is over 20,000 years old. The first sewing needles were made of bones or animal horns, and the first thread was made of animal sinew. Iron needles were invented in the 14th century. The first eyed needles appeared in the 15th century. 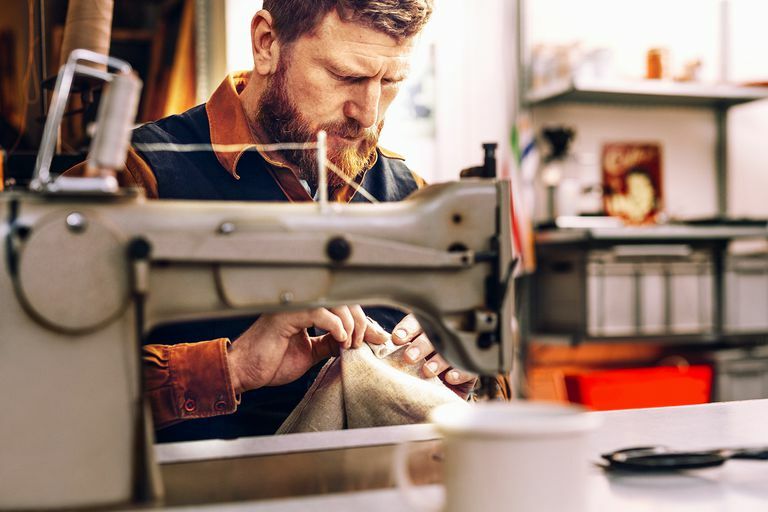 The first possible patent connected to mechanical sewing was a 1755 British patent issued to German, Charles Weisenthal. Weisenthal was issued a patent for a needle that was designed for a machine. However, the patent did not describe the rest of the machine. It is unknown whether a machine existed. The English inventor and cabinet maker, Thomas Saint was issued the first patent for a complete machine for sewing in 1790. It is not known if Saint built a working prototype of his invention. The patent describes an awl that punched a hole in leather and passed a needle through the hole. A later reproduction of Saint's invention based on his patent drawings did not work. In 1810, German, Balthasar Krems invented the automatic machine for sewing caps. Krems did not patent his invention, and it never functioned well. Austrian tailor, Josef Madersperger made several attempts at inventing the machine for sewing and was issued a patent in 1814. All of his efforts were considered unsuccessful. In 1804, a French patent was granted to Thomas Stone and James Henderson for "a machine that emulated hand sewing." That same year a patent was granted to Scott John Duncan for an "embroidery machine with multiple needles." Both inventions failed and were soon forgotten by the public. In 1818, the first American sewing machine was invented by John Adams Doge and John Knowles. Their machine failed to sew any useful amount of fabric before malfunctioning. The first functional sewing machine was invented by the French tailor, Barthelemy Thimonnier, in 1830. Thimonnier's machine used only one thread and a hooked needle that made the same chain stitch used with embroidery. The inventor was almost killed by an enraged group of French tailors who burnt down his garment factory because they feared unemployment as a result of his sewing machine invention. In 1834, Walter Hunt built America's first (somewhat) successful sewing machine. He later lost interest in patenting because he believed his invention would cause unemployment. (Hunt's machine could only sew straight steams.) Hunt never patented and in 1846, the first American patent was issued to Elias Howe for "a process that used thread from two different sources." Elias Howe's machine had a needle with an eye at the point. The needle was pushed through the cloth and created a loop on the other side; a shuttle on a track then slipped the second thread through the loop, creating what is called the lockstitch. However, Elias Howe later encountered problems defending his patent and marketing his invention. For the next nine years, Elias Howe struggled, first to enlist interest in his machine, then to protect his patent from imitators. His lockstitch mechanism was adopted by others who were developing innovations of their own. Isaac Singer invented the up-and-down motion mechanism, and Allen Wilson developed a rotary hook shuttle. Sewing machines did not go into mass production until the 1850s when Isaac Singer built the first commercially successful machine. Singer built the first sewing machine where the needle moved up and down rather than the side-to-side, and a foot treadle powered the needle. Previous machines were all hand-cranked. However, Isaac Singer's machine used the same lockstitch that Howe had patented. Elias Howe sued Isaac Singer for patent infringement and won in 1854. Walter Hunt's sewing machine also used a lockstitch with two spools of thread and an eye-pointed needle; however, the courts upheld Howe's patent since Hunt had abandoned his patent. If Hunt had patented his invention, Elias Howe would have lost his case, and Isaac Singer would have won. Since he lost, Isaac Singer had to pay Elias Howe patent royalties. Note: In 1844, Englishmen John Fisher received a patent for a lace-making machine that was identical enough to the machines made by Howe and Singer that if Fisher's patent had not been lost in the patent office, John Fisher would also have been part of the patent battle. After successfully defending his right to a share in the profits of his invention, Elias Howe saw his annual income jump from three hundred to more than two hundred thousand dollars a year. Between 1854 and 1867, Howe earned close to two million dollars from his invention. During the Civil War, he donated a portion of his wealth to equip an infantry regiment for the Union Army and served in the regiment as a private. The 1834 eye-pointed needle sewing machine of Walter Hunt was later re-invented by Elias Howe of Spencer, Massachusetts and patented by him in 1846. Each sewing machine (Walter Hunt's and Elias Howe's) had a curved eye-pointed needle that passed the thread through the fabric in an arc motion; and on the other side of the fabric a loop was created; and a second thread was carried by shuttle running back and forth on a track passed through the loop creating a lockstitch. Elias Howe's design was copied by Isaac Singer and others, leading to extensive patent litigation. However, a court battle in the 1850s conclusively gave Elias Howe the patent rights to the eye-pointed needle. Elias Howe brought the court case against Isaac Merritt Singer, the largest manufacturer of sewing machines for patent infringement. In his defense, Isaac Singer attempted to invalidate Howe's patent, to show that the invention was already some 20 years old and that Howe should not have been able to claim the royalties from anyone using his designs that Singer had been forced to pay. Since Walter Hunt had abandoned his sewing machine and had not filed for a patent, Elias Howe's patent was upheld by a court decision in 1854. Isaac Singer's machine was also somewhat different from Howe's. Its needle moved up and down, rather than sideways, and it was powered by a treadle rather than a hand crank. However, it used the same lockstitch process and a similar needle. Elias Howe died in 1867, the year his patent expired. On June 2, 1857, James Gibbs patented the first chain-stitch single-thread sewing machine. Helen Augusta Blanchard of Portland, Maine (1840-1922) patented the first zig-zag stitch machine in 1873. The zig-zag stitch better seals the edges of a seam, making a garment sturdier. Helen Blanchard also patented 28 other inventions including the hat-sewing machine, surgical needles, and other improvements to sewing machines. The first mechanical sewing machines were used in garment factory production lines. It was not until 1889 that a sewing machine for use in the home was designed and marketed. By 1905, the electrically-powered sewing machine was in wide use.